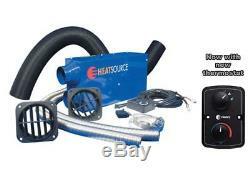 PROPEX HEATSOURCE 12V HS2000 SINGLE OUTLET LPG GAS CARAVAN CAMPER HEATER SYSTEM. Suitable for use on a variety of vehicles including. 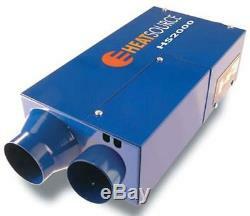 The Propex HS2000 Heater is a heat source that functions completely independent of the engine. Fueled by either propane or butane, this. 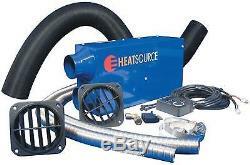 Is an automatic blown air heating system that is a clean and efficient method for heating your. Uses a dependable thermostat to measure room temperature and automatically ignites and heats the room should it drop below the selected temperature (switching off when the optimal temperature is achieved). A single outlet vehicle kit (V1) contains. 1 x 1 metre 60mm ducting. 1 x 1 metre combustion inlet pipe. 1 x 0.75 meter Stainless Steel Exhaust pipe. 3.5 metres thermostat wiring harness. 3.5 metres 12v supply harness. 1 directional hot air outlet. 1 directional cool air return vent. Hose clips, fasteners, screws, inline fuse, instructions, drilling template. Gas Consumption figures (under continuous operation): Average consumption 142 grams/hour 3.9kg propane cylinder will last - 27.5 hours 4.5kg butane 31.7 hours 13kg propane 91.5 hours 15kg butane 105.6 hours 19kg butane 133.8 hours. 12v & LPG or 24v & LPG. Specialising in Caravan Camping and Swimming Pool Equipment. It's our mission to bring you the best service and product support available. We all know when you've set yourself a task then you usually want to get on with it ASAP. If its a Motorhome air conditioner, caravan fridge, even a pool toy, the last thing you want is to be waiting for days or weeks for it to arrive. Need advice or want to come and view products at our warehouse? No time can be specified and a signature is required on receipt. Goods can be left on your property without a signature; however this is at your own risk. Certain postcodes incur a surcharge - Scottish Highlands and Islands (FK17 - 99, G83, IV1-28, IV33-39, PA21-23, PA35-40, PH18-26, PH30-42), Off-shore which includes Isle of Wight, Isle of Man, Channel Islands and Northern Ireland. Surcharge areas are decided by the courier companies, not JLS Ltd. When will my order be delivered? For urgent next day deliveries, we recommend you call. UNDER NO CIRCUMSTANCES CAN WE ACCEPT A CLAIM FOR LOSS OR DAMAGE IF THE GOODS ARE SIGNED FOR AS "IN GOOD CONDITION", "UNEXAMINED" OR "UNCHECKED" YOU MUST SIGN AS "DAMAGED". If there is a specific date on which you would like your order delivered, please state so when placing your order. Do I need to be in to receive my order? You can request to have your order left without signature, or to have the order left with a neighbour. If you request goods to be left without signature, e. "Round the back of the house" or "On front porch" etc this is at your own risk - we cannot take responsibility for goods that are subsequently stolen or damaged. Can I have my order delivered to an alternative address? My goods have not arrived. I want to return or cancel my order, what do I do? It's ok to change your mind. All packaging must be intact so that the item is in an unused and resaleable condition. Seals and wrapping must be unbroken. In the event you place the order and immediately decide to cancel you must let us know the fastest way possible to avoid incurring costs. How to return an item by post. Pack the goods carefully so they will not be damaged in transit. Enclose a brief explanatory note and your contact details. Print out our address label. We can collect in some circumstances. We would advise you of the cost before we proceeded with a collection. Failed collections are still chargeable. How to return large or heavy items. Please send us a message for guidance if the item you wish to return weighs over 5kg. There may be additional charges to cover the cost of collecting large or heavy items. If you've changed your mind about an item you will need to pay for the cost of returning it. Please see above for further guidance. If you have received the wrong item or there is a fault with it, we will cover the cost for you. Faulty items should be advised by telephone and an initial checklist with one of our Technical Team completed during the call to try to resolve the issue. The tech consultant can agree to check out the fault and arrange for collection of the item. Your statutory rights are not affected. Be the First to Know. Get all the latest information on Events Sales and Offers. Sign up for newsletter today. The item "PROPEX HEATSOURCE 12V HS2000 SINGLE OUTLET LPG GAS CARAVAN CAMPER HEATER SYSTEM" is in sale since Monday, November 20, 2017. This item is in the category "Vehicle Parts & Accessories\Motorhome Parts & Accessories\Accessories". The seller is "jacksons-leisure-supplies" and is located in Cheshire. This item can be shipped to United Kingdom.